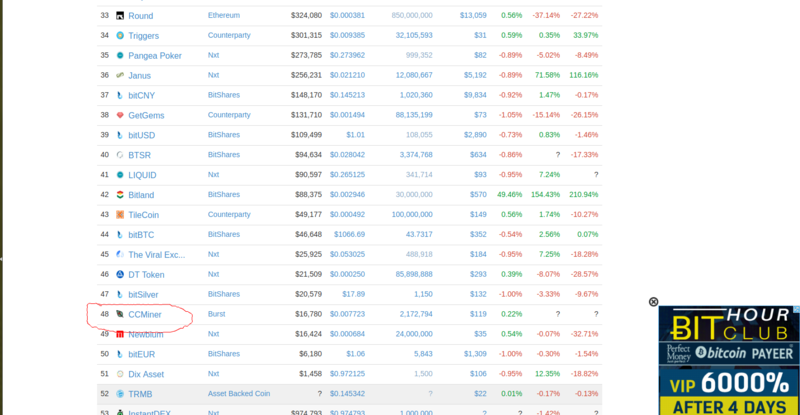 I have been able to let CCMINER1000 be listed on coimarketcap in their asset section (https://coinmarketcap.com/assets/views/all/). My asset is the first one listed there and I'm going to write how I achieve this, so the other asset issuer can get the same! Due to the fact that I've already gave to them all the instructions to get the asset data from the BURST/NXT API (thanks @dawallet). select " I want to request to add a new cryptocurrency." than click continue, put the name of your asset, if you have a website put the link, else leave it blank, in the "Which exchanges is it traded on?" write BURST ASSET EXCHANGE. Both in "Please provide a URL that shows the total supply of coins in real time." and "Please provide a URL that shows the publicly available supply of coins in real time. These are coins that are not held by the creators or private investors. Required for market cap ranking"
About 6 hrs ago sent BtcDragons Asset details to be added !! @Bitdv nice good luck with it! I've just sent the request to add BurstOcean as well. Thank for the guide, @ccminer ! I followed all the steps but haven't been listed or received an email. It's been two weeks. This way still works now?